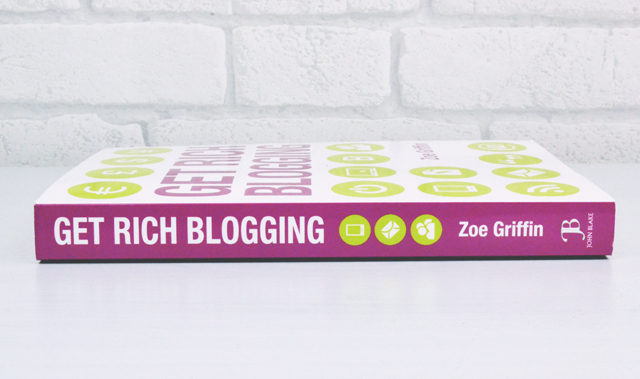 I bought Get Rich Blogging for the simple reason that it pops up on blogs so often and I'm looking to make some more money out of blogging (which is going to lead to some exciting things but you'll find out about that soon enough!) To say I was disappointed would be an understatement. If you want a book that recommends keyword stuffing, asking other bloggers to put you on their blog roll and spamming other Facebook pages with your links, this is the book for you. 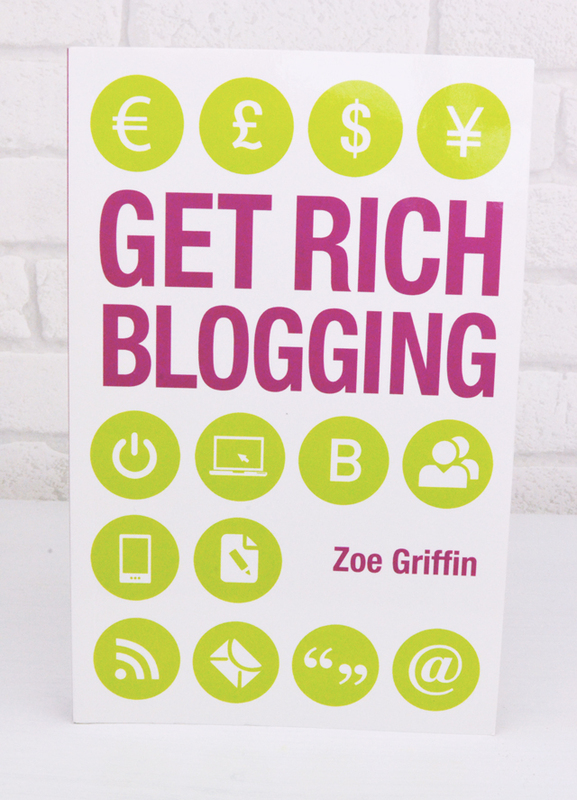 Get Rich Blogging is written by Zoe Griffin, a former showbiz columnist who has found success with her entertainment blog, Live Like a VIP. Her book aims to share the secrets to her success and teach readers how they can make a six-figure sum from their own blogs. The first part looks at the basics of how to build a blog and the second part interviews bloggers from different areas of blogging such as fashion, beauty and food. Unfortunately, the majority of Get Rich Blogging has nothing to do with making money and is instead a guide on how to set up and maintain a blog. 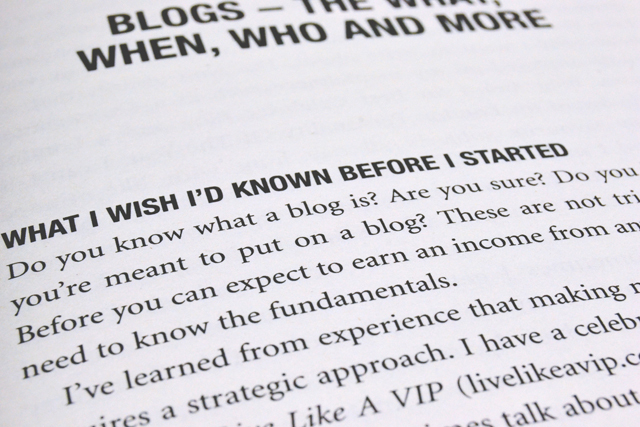 Of course this is important- you can't make money from blogging without knowing how a blog works, after all- but I did find the title quite misleading. This wouldn't be such a problem if it was a helpful book which, sadly, it's not. It's quite clear that Griffin has a limited understanding of the technology behind blogging which is apparent in her frustratingly unnecessary information. For example, every time she mentions a website, she includes the full url in brackets, sometimes even with the http:// eg: "You can use Blogger (http://www.blogger.com)". This completely slows down the pace of reading and adds absolutely nothing since, you know, you can't click a link when it's written in a book. Another example of this is her explanation of HTML complete with (hyper text mark-up language). I don't know about you, but that definition means nothing to me. Until I read this book, I didn't know what HTML stood for and it didn't hold me back. Rather than actually explaining what it is and what it does, Griffin just breaks down the acronym and leaves it at that. Not helpful. I also found huge problems with some of her advice. As I said above, she recommends keyword stuffing as good for SEO (search engine optimisation, as she happily points out) and contacting successful bloggers to ask if you can be placed on their blog roll. When it comes to promoting your blog, her first tip is to use merchandise such as pens with your blog logo on, followed by hosting a party and inviting magazine editors. That may be easy for an established showbiz reporter to achieve, but not so much for your standard blogger starting out. Furthermore, there are some horrendously inaccurate and outdated statements such as "advertisers won't take you seriously if you're using a free blogging service" and mentioning live chats on Myspace. This book was published in 2013 and it mentions Myspace. Did I learn anything from this book? No. Not a thing. Pretty much the only thing it says in terms of making money is to keep up good content and people will discover you, although it does also have a massive list of PR companies for big brands. Have I made it clear enough that I didn't like this book? To be perfectly honest, I rolled my eyes through the whole thing and for that, I give it 2/10. This is a very old blog post, as you will be able to see, but Blog Inc, although with its own problems, was a much more informative read. A very useful and honest review compare to others I have seen on this book. Thank you. Oh dear. It sounds more like a book for those who have seen other people do it and want to try and imitate their success rather than a book for those who already have the basics of the blogging bit down. It also sounds very naive. I'm not sure how many bloggers would really add someone to their blogroll just because someone asks! Good to know! I've got a long list of blogging books I wanted to read while on my 'baby holiday' and I'll be sure to skip this one. Wow I think 2 stars is being good from what you've told us lol. And omg myspace haha. Thanks for the review it was interesting! Well, thats disappointing. Reading your review and the book title is very misleading. Wow doesn't sound like a very helpful book. I have to say, I haven't heard about it. But now it sounds like one of those advice books which have 3 main points to say that could fit in an article or a blog post. However, they decide to write the whole book about it. Oooh ouch that doesn't sound like a good book at all. The title is definitely misleading, I would have gotten that book expecting help and tips to help improve my blog in ways that I could make a penny or two. I don't need to be told to bother bigger bloggers and throwing parties I no way could afford - never mind those people wouldn't come because WHO AM I exactly?! Foolish thing to put in a book. As for the putting in the whole URL could she not have done a list of "Useful links" at the end of the book instead of mentioning the site and adding (http://www.sitename.com) which as you said, would and did slow down the reading. As for telling you what HTML means, that's neither here nor there for a blogger - as long as you know the basics of HTML you don't need to know what HTML stands for, surprised she didn't tell you what HTTP:// stands for either. (I actually do know both but I've studied in web design and that was something you HAD to learn for the course - how many times have I needed to know that HTTP:// means Hypertext Transfer Protocol and HTML means Hypertext Markup Language SINCE finishing that course? Zero. So bloggers don't need to know that either and it doesn't help get them rich. Well, in a sense I bet she's made bank off this book... Sigh. Sounds like a worse read than some of the youtuber books, which is saying something. Though the PR contacts at the back sound like the most useful thing in all those pages. And myspace? Really? I know they've been trying to relaunch that for a while but damn. So glad I read this review before wasting my time reading the book!